Pontiac Solstice Forum > Off Topic > General Off Topic > How about that weather? Discussing the upcoming winter storm in Michigan, I told my bride "Cool! I love a good storm!" She replied "I know that you do." whilst giving me the look that says "There are elements of your existence that I will never understand." As a kid that grew up on the Canadian border, it's rare that we get anything near the winter storms we had there. We received probably 6-7 inches today, bringing the total on the ground to about 12 inches. Might get another 6 inches over the next two days but Wednesday's high is going to be minus 4. Drifted up pretty good in areas around the house where the wind spins and dies. I just came inside after removing 10-12 inches of "white death" from the driveway, and it's still snowing. 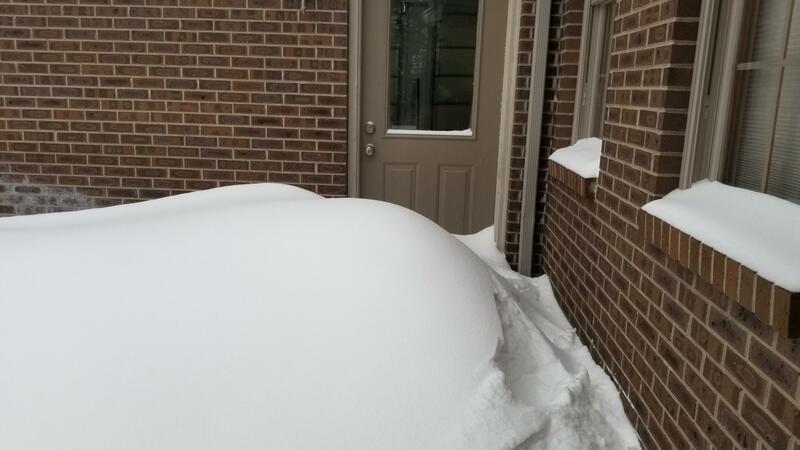 We have several drifts like the one in your picture! It snowed here Saturday morning. It was gone by noon. 63 and sunny here today. High 70's for Superbowl weekend! Have family in the Green Bay and Kenosha regions - know they've been getting hit hard too! We get snow for a day, then the sun comes out and it melts and is gone. We have had three storms that dropped 3 to 8 inches each. I get out the three stage, clear the street, sidewalks and driveway then wait for the sun to blast it dry. And of course the snow comes back in two or three days. We have seen 30 inches in my driveway. That is fun! We are south of Detroit. Lots of snow today and getting really cold over the next few days. On a happier note, spring is only a couple of months away. I've only been here about 8 years and I feel like this has been quite a bit of snow for us. Perhaps it's because I've only owned a house here for two years, so I'm finally having to shovel snow, whereas I've never had to before. Is this amount of snow normal?? It was in the 70's today, but we are supposed to get rain this weekend. The cold front missed SoCal. Has been really nice the last week or so, supposed to be near 80 tomorrow. I live at 4500 foot, so I get a fair share of snow, or did. Not much the last 10 years with our drought. The most I have seen on the ground here is about 18 inches, but and inch of ice under it. Snapped limbs off of my oak trees, some the size of man hole cover. I can deal with the snow, but the cold you guys are supposed to get, I could never handle again. Grew up in Nebraska, where it got cold and very little snow. Don't miss the midwest in the slightest this time of year. Fire season a different story. Its cyclical and regional. We moved to Castle Rock in 85. We had snow window deep on Lovie's Jeep Wrangler every year. 12 to 18 inches of snow was not unusual. Generally 3-4 times a year. We moved to Colorado Springs and got snow 6-10 times a year where we lived in Widefield. I had a tracked snow blower because I needed it. The first year we moved to Parker in 96 I got snowed in on Pena Blvd over night and when I finally got to my neighborhood it took me over an hour to travel a block to my driveway. The snow measured 30 inches deep in the street on the level in front of my house. It took me hours to blow the driveway so I could get the truck parked. Last year I did not need the blower as the snow was sparse and infrequent. I called in sick to work Monday, only to find out that work shut down at 10AM and gave everyone paid Administrative Leave. Except me because if you're on SL/AL you don't qualify. We plowed the driveway & sidewalks twice including our older neighbors who live on a corner lot, plus the house on the other side of us because he's a EMT and seems to be at work constantly. Plus we live close to two schools and a few colleges so we tend to get our share of foot traffic regardless of the weather. My shoulders hurt, I still have a slight headache, and I'm definitely feeling my age. Plus we're praying that we don't lose power because we usually do when it gets really nasty out. But no wildfires, no floods, no earthquakes or hurricanes, so I guess we're good with the Polar Vortex every now and then. I do my neighbors who are all about half my age because they cant do it. The neighbor across the street is at least 100 pounds over weight and has already had on heart attack. I do his place too. I have three generators. A 5kw diesel that will run everything in the house but the AC. And two 2kw generators that can be paired to run everything in the garage. We are pretty much self sustaining for about a week then I need to go find more fuel. There also aren't a huge number of animals or insects that are out to kill you in the midwest! Unless you count running into deer. I am probably cursing myself by saying this, but one of the great things about living here is the moderation. We get four seasons with occasional droughts, occasional deep snow (well, 13 inches is deep here) and occasional severe storms. We don't typically need generators, snow blowers, hurricane evacuation routes, or tornado shelters, and our "extreme" temperatures aren't really that extreme. We do have stupid, suicidal, deer.